GREENCASTLE pals Mairead Harkin and Mary McLaughlin are limbering up again for a repeat of their local charity 10K fun run. The lifelong friends, who held their first event last year, are inviting people to join them again to raise funds for The Alzheimer’s Unit, Carndonagh and Foyle Sailability. It all started with a New Year's dare last year, but the girls say they remain committed to their new sport. 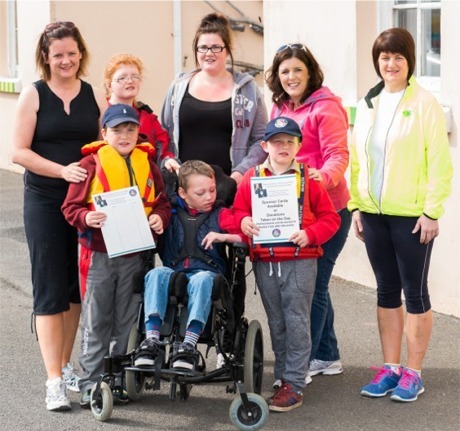 “We were overwhelmed by the support we received for the fun run in 2015 and even before it was fully finished people were saying we had to do it again,” said Mairead. “So it wasn’t a difficult decision to stage one for 2016 and if anything, it has spurred us on to keep running”. Mary said they both “feel really strongly that we want local charities to benefit from the event and we have chosen The Alzheimer’s Unit, Carndonagh and Foyle Sailability as our chosen charities, because we know first-hand the work they do and we know that any money raised will be spent locally”. Despite a hit-and-miss summer weather-wise so far, Mary and Mairead are confident the elements won’t deter the community from supporting their upcoming event. It will take place on Sunday, August 28, 2016 at 2pm (Registration from 12.30pm at Kealey’s Bar, Greencastle). Entry is €10 and kids go free. Everyone is welcome. More details in the Inishowen Events Guide .